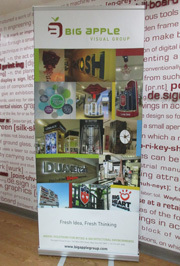 Big Apple Visual Group has a banner stand to meet your exhibit and presentation needs. Our light weight and compact units compliment your need for a portable graphic message solution. Using everything from sturdy substrates to sheer fabrics, these retractable sign units are designed to amplify both content and environment . 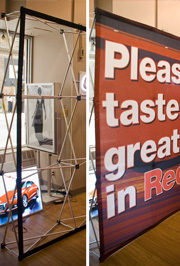 Quick visual display solutions with this POP-Up banner frame. Available in diverse printed materials and finishes. Also, with bolt based system that allows you to add or subtract components. Whether it’s a customized portable billboard or a large Step & Repeat backdrop, all you need is the graphic to create great impact while banner frame has incredibly easy setup. Available in sleek styles and finishes, featuring single or double sided graphics, and mainly made in Aluminum construction. Our Banner Stands have a telescopic pole that expands to desired height up to 96”, they are portable, and in some cases, prints can be inserted or interchangeable, based on your production order needs. 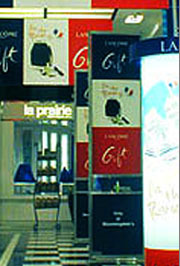 Aluminum signage stands are available in several Powdercoat Finishes, featuring display of 3 Graphics. Each image poster is overlapped by ¼ “ frame around its visible area and has quick-change insert opening on its side. Custom base components can be made by special-order.